Savoy (pronounced Savwa) Cake, or Sponge Cake, dates back to the 18th century and is a simple cake using five pantry ingredients. The only odd ingredient is potato flour, which helps produce a more tender cake. 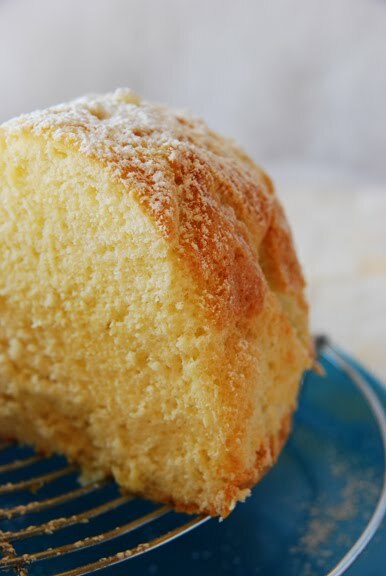 Although similar to a pound cake, it's often baked in a mold that looks like a turban. After combining the yolks, sugar and vanilla, fold in the flours. Then, after whipping the egg whites, fold them into the yolk mixture. Bake at 350°F until the center comes out clean. Dust with confectioners' sugar and serve with crème anglaise or fresh whipped cream and berries. Très simple. You can find the recipe for Biscuit de Savoie (Sponge Cake) in the book Le Cordon Bleu at Home or here. To see how the rest of the Whisk Wednesdays group fared with their recipe, click here (or check out the sidebar) and then click on each blogger! Serve with crème anglaise and berries. I was surprised by how much we liked this cake. It was perfectly sweet paired with berries and fresh whipped cream and seemed a cross between angel food and pound cake. Sometimes the simplest recipes are the best. chinatown makes some of the lightest and most springy spongecakes I have ever tasted. I have always wanted to know how. Alternatively, you can steam the cake batter, which equals moist goodness. Beautiful! The crumb looks just perfectly moist and tender. Ooh...this looks wonderful. I'll like the texture. YUM. Well, I was thinking of ditching this week, but I guess I will probably just be late instead as this looks good, simple, and a recipe I should probably have at my disposal. I am just desserted-out at the moment! Four of my blog alongs this week were desserts and a famaily can only just eat so many desserts, right? Might make this in a little 4" pan. Yours looks beautiful. I agree that sometimes the simple classics are the best. This looks great -- and it could be used so many different ways. I'm inspired! Thanks! Sponge cakes are some of my favorites. Potato flour, huh? Brilliant! This cake sounds delicious. I'm so intrigued by the potato flour that I'm going out to look for it. I also love how easy it came together for you. This looks beautiful and delicious! I'm excited to have found this blog and add it to my sidebar. I wish I'd seen this in time...I'd have made this for my granddaughter's birthday cake...strawberry shortcake! It would have been marvelous! Beautiful presentation Shari! It looks so... spongey! You're right, sometimes simple really is best. Is potato flour just potato starch? 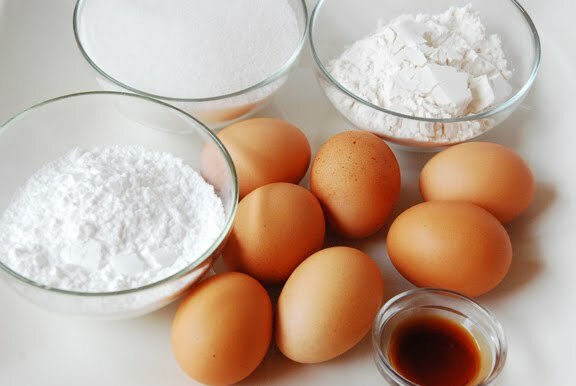 Hi Colette, I found this link that will help you with your question: http://www.foodallergyqueen.com/2009/04/potato-starch-vs-potato-flour.html Good luck!